By Tom Balbo. Paper and found objects. Courtesy of the Morgan Conservatory and Jacqueline Bon. The Morgan Conservatory’s mission is the preservation and advancement of “the ancient art of papermaking.” That mission is well-served by its exhibition opening this week, Unknown Terrain. Breaking preconceptions about paper in the fine arts, the Morgan’s show hosts more than a half dozen large installation made entirely or primarily out of paper. Paper is most often treated as a pure surface. It is a plane with height and width, onto which images are drawn, pressed, or painted. Some process- or material-focused artists may draw attention to paper’s fibrous texture; but its third dimension, depth, is generally ignored. Art on paper is usually hung on or tacked to a wall, unlike 3D works that can be placed in the center of a room and seen from indefinitely many angles. Gallery and Artist Opportunities Coordinator Anna Tararova said that the Morgan Conservatory itself has mostly exhibited works framed on walls. Unknown Terrain is an effort to break this routine. “We have a very large space, and we thought it would be a good idea to fill it up,” said Tararova. 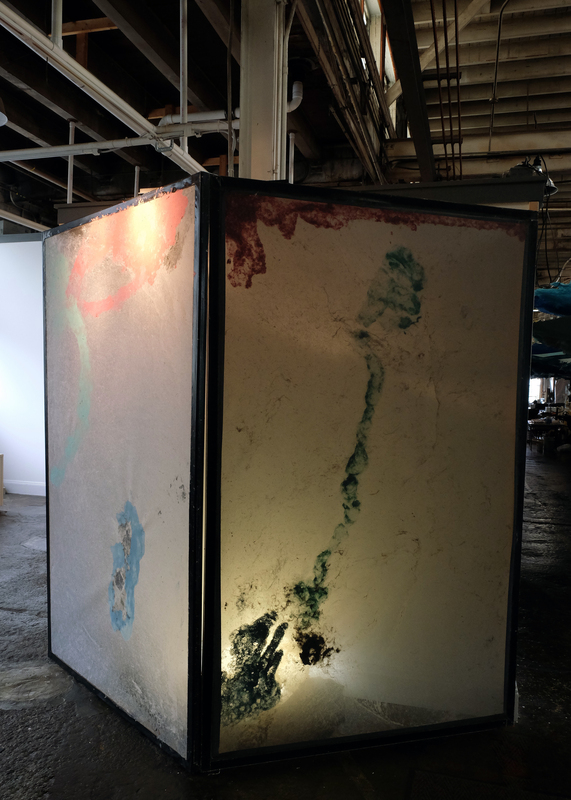 Tom Balbo, the Morgan’s founder and artistic director, has contributed a work consisting of translucent paper, marked with blue, pink, and red, and stretched over a folding room divider. Light, emanating from a bulb behind the divider, leaks through the gossamer paper. Beside the light fixture, we can made out an enigmatic pile of sandy powder. In an artist statement, Balbo wrote that in crafting his piece, he drew inspiration from both painting and sculptural traditions. He asks us to consider his paper both as a colored surface, and as an object taking up its own space. Balbo is exhibiting alongside five other artists: Susan Danko, Taryn McMahon, Megan Singleton, Kristina Paabus, and Danielle C. Wyckoff. Besides commitment to paper as a material, participating artists all relate their work to the idea of an “environment.” However, “environment” is a word with many meanings, and different artists proceed from several of the term’s different uses. “Rift,” Susan Danko. Painted paper. Courtesy of the Morgan Conservatory and Jacqueline Bon. Balbo, for example, draws attention to “the environment” as our surroundings as they are immediately experienced, full of objects that are at the same time meaningful and hard to classify as just one thing. Other artists are concerned with “the environment,” in the ecologist’s sense. Singleton and Danko make tangible the effects of human activity in the natural world. The two artists take local and global perspectives, respectively. Singleton, who is based out of St. Louis, MO, makes the impact of invasive species immediate and tangible in her work. At the Morgan, she has cultivated an eerie garden of shoulder-high flowers with crinkly, off-white petals. The plants look as if they died from growing too large too fast in soil they were never meant to know. 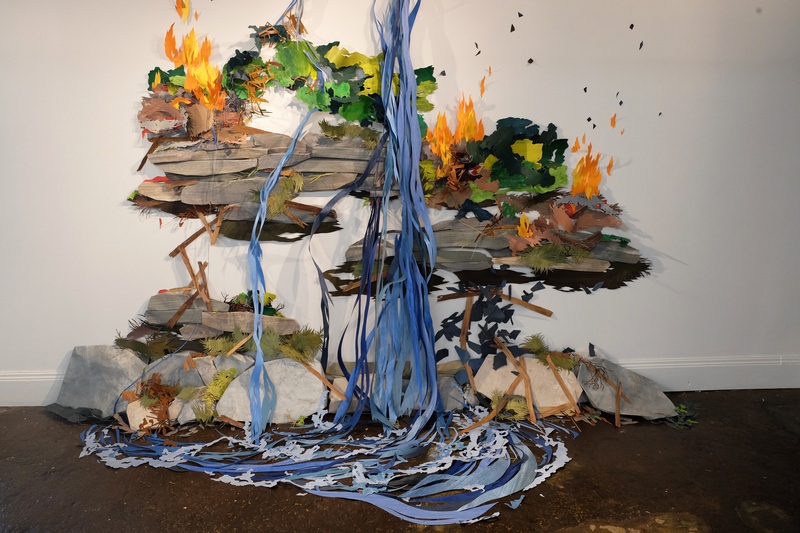 Danko’s assemblage “Rift” is a tableau of a world wracked by climate change. Using painted Bristol paper, Danko constructs a rocky waterfall with vegetation along its banks. At the top of the cascade, thriving green leaves have caught fire. Flames have yet to reach the foliage at the falls’ bottom, but they are browning and withered from heat. It is a small-scale vision of an apocalypse. Wyckoff’s “passage” might be the most layered work on display. It simultaneously creates a surreal environment for visitors to inhabit; and it offers a new, apt metaphor for the psychology of love. 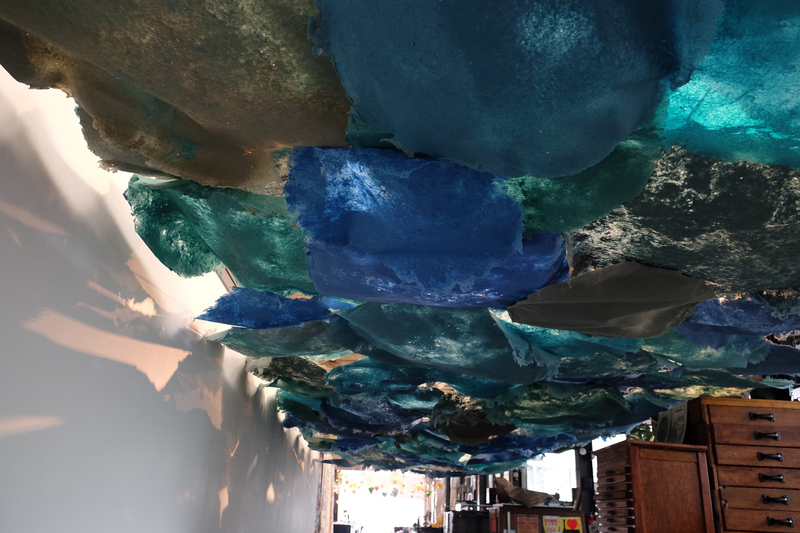 In “passage,” blue and blue-green disks of handmade paper hung from the ceiling. They are designed to resemble the surface of water, seen from below. If viewers can succumb to this pretense, they find themselves in a dreamlike situation: They are submerged, but they never need to come up for air. Pressed upon on all sides, they are nonetheless free to move in any direction. During daylight hours, light leaks through gaps in the disks, casting veins of illumination onto a nearby gallery wall. These light patterns are reminiscent of the shimmers cast on the bottom of a pool or pond by lapping water overhead. From “passage” by Danielle C. Wyckoff. Handmade paper. Courtesy of the Morgan Conservatory and Jacqueline Bon. Wyckoff, who is based out of Grand Rapids, MI, has conducted a career-long conversation about love, and “passage” is a chapter in that exchange. In “passage,” simulated water is used to create the feeling of “immersion,” a physical sensation analogous to how love transforms experience. It is not just one’s perception of the beloved that changes for the lover—certain projects take on new urgency, and familiar objects take on new values that reflect the interests of the beloved. Like clear water engulfing us, love makes itself known, even if we cannot see it. Because each of its installations asks viewers to enter a different headspace, Unknown Terrain is an exhibition that demands patient viewing, or multiple visits. It puts the vast, industrial space of the Morgan to a new use; and it opens eyes to unimagined possibilities for the conservatory’s beloved pulpy medium. The opening reception for Unknown Terrain will take place this Friday, July 6, from 6 to 9 p.m. The exhibition will run through Saturday, August 11 at the Morgan Conservatory. 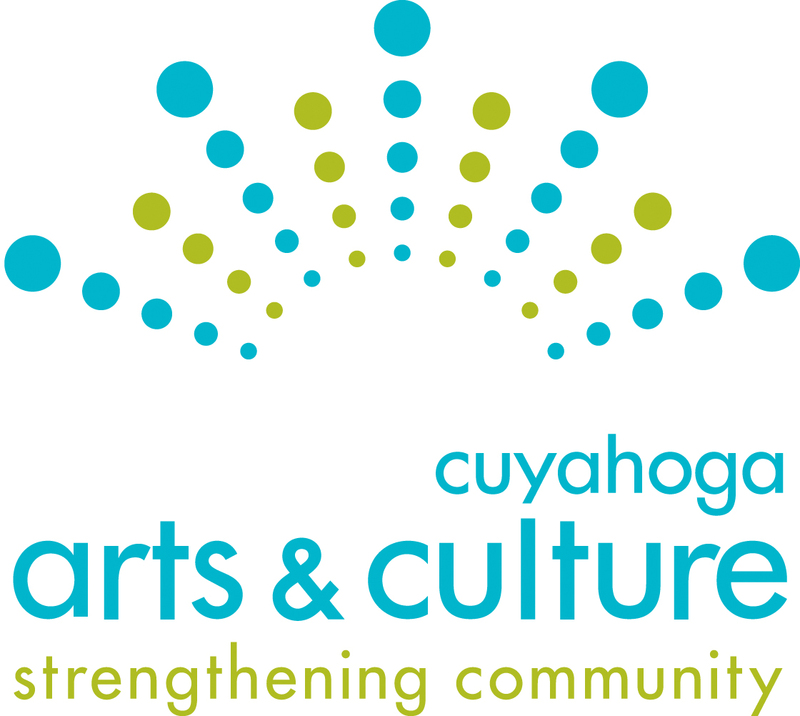 The gallery is located at 1754 East 47th St. For more information, call the Morgan at 216-361-9255, or visit morganconservatory.org.